Psychbigyaan team Visted the school! ‘’We need Counselors in Every School’’- This has always been one of the major belief of Psychbigyaan team. 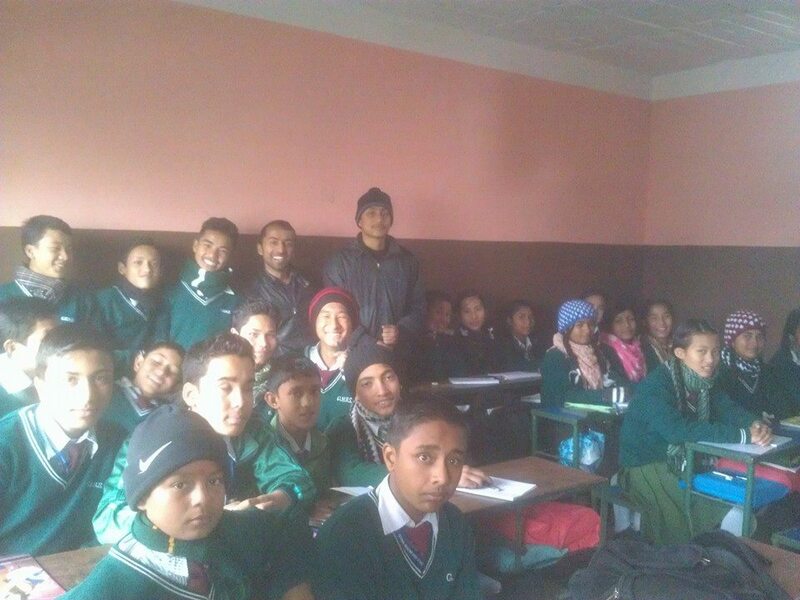 With the motive of awaring students about transition and letting them know about Psychology and Mental Health, Psychbigyaan team Kripa Sigdel, Sujan Shrestha and Sanjeev Bhandari visited a school named ‘’Gyan Bhumi Secondary School’’ of Futung Nagarpalika, Kathmandu on Sunday, 14 December. 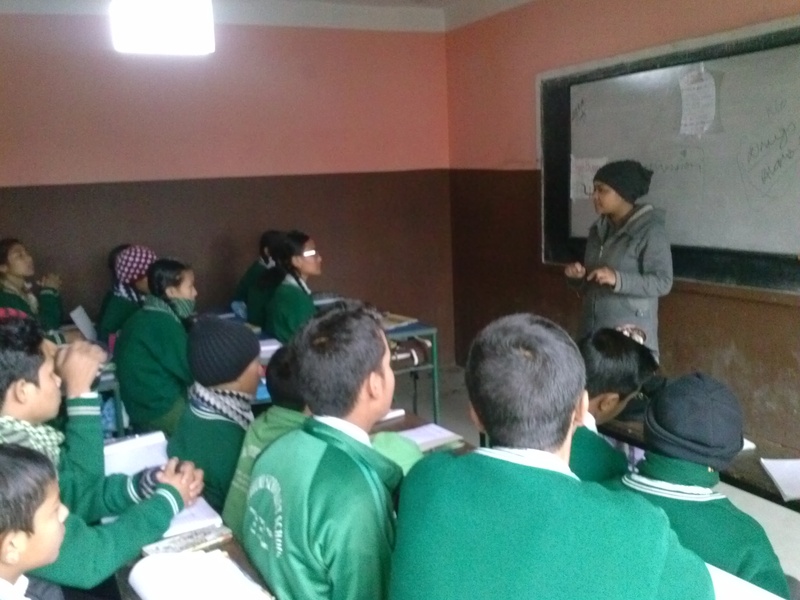 The team gave information to the 55 students of class 9 and 10 for 2 hours. The program combined the information sharing, games, Psychological tests, motivational tips, meditation, relaxation techniques and question and answer round. This made students not feel bore despite long class hours. Also, being Psychology Graduates, Psychbigyaan team created a friendly information sharing session for students which made students to enjoy and receive the information with fun. Firstly, the sessons started with the introduction of the team, Psychbigyaan and whole class. Then Sujan Shreshta talked about transition, identity crisis and many psychological aspects of that age. He also mentioned about identity and identity crisis in teenagers. He also explained the confusions and how to minimize it. He also talked about the dangers of falling into the bad trap of drugs due to the stress , anxiety and peer pressure in that age group. He made them aware about the psychological problem taking toll on young people’s mind and about increasing suicidal rate among the teens.Then the team conducted WAT (psychological tests ) to the students. It was a fun session. Then, Kripa Sigdel talked about motivation and the need of motivation for students. She also shared 10 tips that can help students to remain motivated in studies and all round development.Then team tried to make the session fun thing including games and feedback sessions. Team also motivated students to challenge and put their strong foot forward. Then, Sanjeev Bhandari,explained how important is positive thinking. He talked about 6 important steps improving life. Those were vision, visualization, oxygenation, auto-suggestion, celebration and action. He also conducted a minute relaxation session for students. Hence, the program ended informing about whom to contact when in need of any help, especially, psychological help. Psychbigyaan team focused on how important is sharing and releasing any kind of stress. The team also tried to make students capable of self-help when get some mild psychological problems. Finally, after some question answer session and feedback session, program ended. Feedback sessions made the team realize how important is such sessions and how important is to conduct these session again. The team left school exchanging thanks to students and teachers. It was good experience for the team and team psychbigyaan is proud for conducting this. 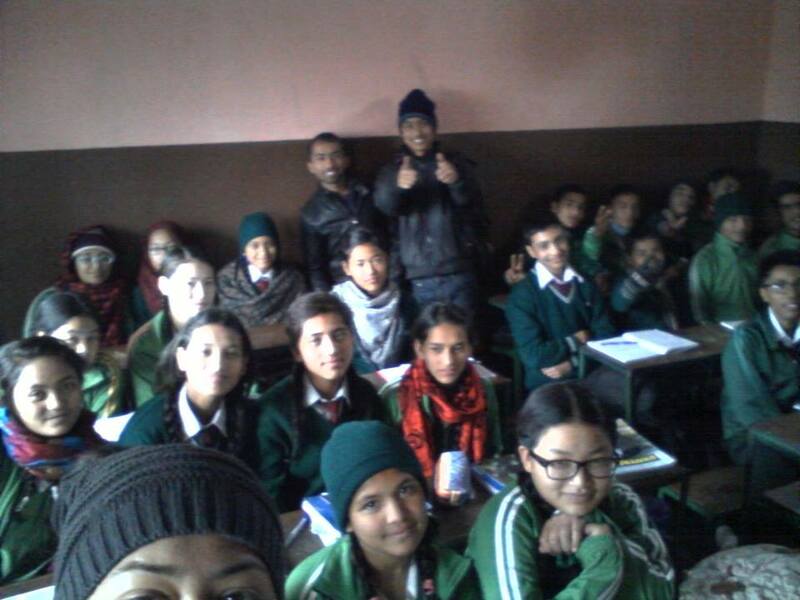 Kripa selfie-ing with other Speakers with students of class 10.
capturing class 9 students in a frame with Team Psychbigyaan.